Amazon’s Kindle fire tablet is all set to arrive for the consumers next week. The model looks very much similar with the BlackBerry Playbook but the model comes offered at an amazing price of $199. This model is expecting a great response from the consumers as about 3 million to 5 million before even this year ends according to some analyst. Amazon, the Seattle-based online retailer giant has already asked their manufacturers to raise the production of the tablet to meet the extended demand as it was reported on the Taiwanese news and also on DigiTimes. According to DigiTimes the production of the Kindle Fire is increased to more than about 5 million units before the end of the 2011 as the pre-order for the device is very strong. They have earlier raised the order volume to 4 million from 3.5 million in the middle of the third quarter, so this time it is the second time they have raised the production because of the expected high demand. 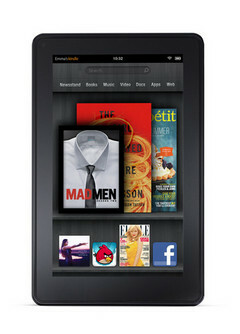 As Amazon is producing such number of devices they must be very confident about the sale of the Kindle fire tablets. They expect to sell about 5 million units before the year ends, which will put them in the next position after Apple’s iPad. Although the price of the Kindle Fire tablet is less than a lot of tablets in the market it also features many lower end specifications like 8GB of storage, and a stripped version of Google’s Android operating system.